I bought the 33 1/3 guide to Double Nickels on the Dime and have been listening closely to that album the last few nights as I read the essays about each song. The careful relistening in conjunction with more background info reaffirm my opinion that this is the finest album of the 80s and probably one of the top five of the past quarter century. It's a jazz album as much as it is punk. For me the guide's most revealing insight is how collaborative Minutemen's creative process was. All three musicians --along with friends and random notebooks-- contributed lyrics. All three wrote songs. 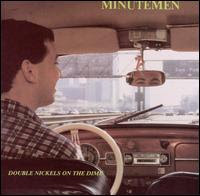 Double Nickels was a double album with four sides. Each musician got to pick the songs for one side, in rotating schoolyard selection fashion (the remaining songs made up the fourth side). But it's in the actual music that the collaboration is most apparent. Each instrument is integral. None (apart from D Boon's voice?) is really showcased. It's a team effort from idea to album. In photography there is a very strong mythology which runs counter to the idea of collaboration. For lack of a better word it is the myth of the auteur. Think of Atget out roaming Paris, or Disfarmer quietly making genius portraits, or Frank driving the U.S. on his personal quest. Each personifies the brilliant genius who must create his art alone because art is inspiration and can't be filtered or helped by others. The word auteur actually comes from cinema where it is used to describe certain directors. But I think the description is much more appropriate for photography. No one pretends that any film can be produced by one person. Hundreds of people are involved in any cinematic undertaking. But with photography, being an actual auteur is much closer to real possibility. Especially in the heyday of black and white, one could go out, shoot, develop, edit, print, matte, and sell one's own photos all solo. Now in the digital age, this possibility has been extended to color printing and bookmaking. And blogging. The possibility of complete control was a big attraction for me to get interested in photography. I'm a loner. I can't work with others. I always think I'm right even when I'm not, and that leads to problems collaborating. So when I read about Minutemen sharing ideas it's sort of mind-boggling to me. Each of the 3 of them was talented enough to strike out on their own, yet they had some sense that through sharing ideas they could reach higher. What was in them that is not in most photographers? Would my photography be helped by more input from others? Shawn Records, who I briefly mentioned in an earlier post, now has a blog up. He's a good writer and it's worth a look. Although the blog has just recently started seriously getting down, it actually took its first breath last summer. One of Shawn's first posts is the obligatory "Why am I blogging?" post. Shawn's (wife's) brief answer: Ego.